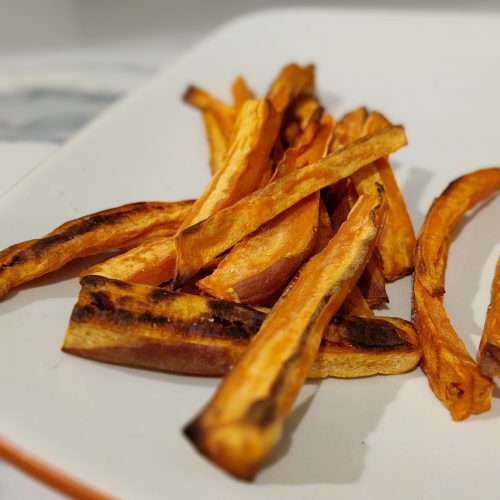 These sweet potato fries are about as natural as you are going to get! 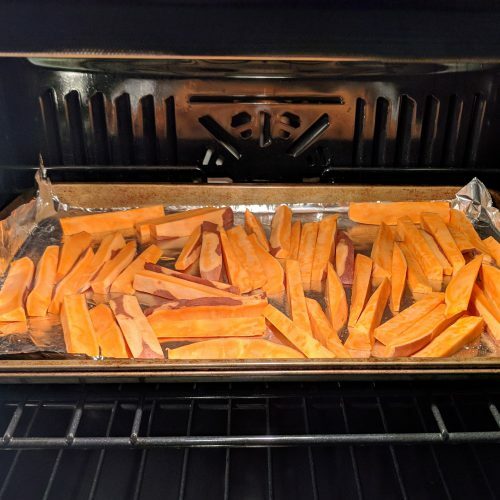 They are super easy to make and only require an oven, baking sheet, a sweet potato and sea salt! I used a 500g sweet potato and got 4 servings out of it. In one serving, there are 108 calories, 25g carbs, 0g of fat and 2g of protein. Baking the fries is much healthier than cooking them in oil! You are leaving the potato in its natural state and only elevating it with a little bit of sea salt. 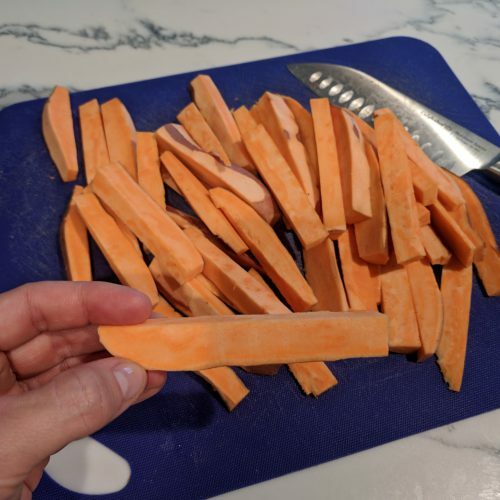 I am terrible at cutting fries. I basically keep halfing the potato until I cut something that resembles a french fry. Remember I am not a real chef. I am just an ordinary girl who loves food and likes to eat healthy on the reg. 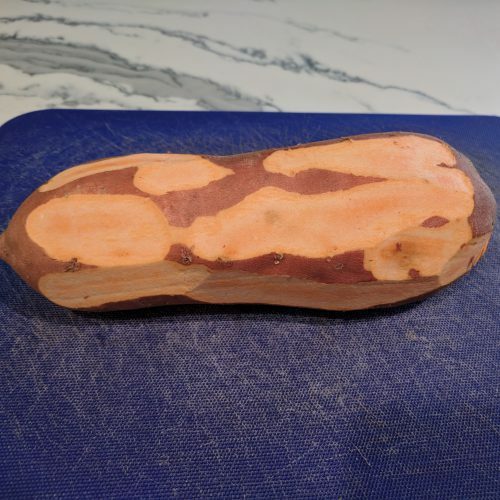 You can buy sweet potatoes singularly at any local supermarket or at Trader Joe’s. Trader Joe’s is cheaper but they don’t have a scale for you to see how much you are buying. However, when you are making fries weighing them doesn’t matter as much as it would if you were adding them to a specific recipe (like my sweet & spicy crockpot chili!) You can also buy a bag of mini sweet potatoes at Trader Joe’s for cheap! 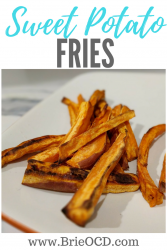 You can serve sweet potato fries with anything! I love to serve them with my avocado egg burgers! The whole recipe is way healthier than eating fast food and you will leave the dinner table feeling satiated and happy! cut into the shape of fry you desire. I do a size between matchstick and steak fries. I basically keep cutting the potato in half, in half, in half until I get something that resembles a fry. 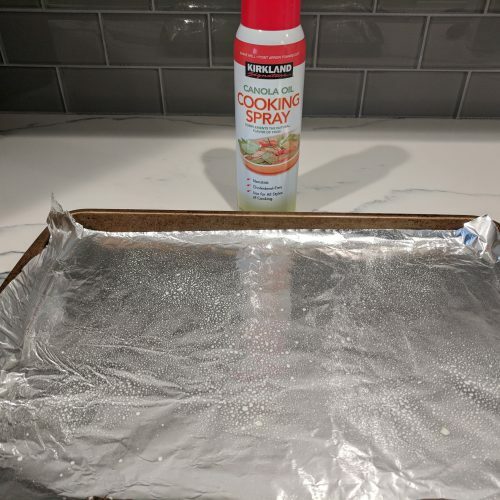 line a large baking tray with tin foil and spray lightly with cooking spray (for easier clean up). 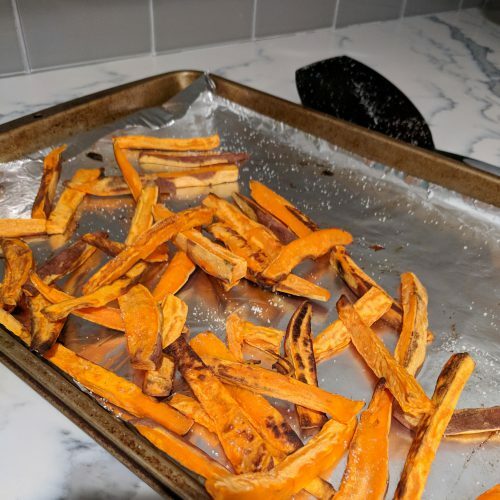 spread fries onto baking tray. Bake at 425 degrees for 20-30 minutes depending on your preferred crunch. Flip fries halfway through. toss with sea salt immediately out of the oven. serve and enjoy! Great with my Avocado Egg Burger Recipe!